How does it feel when someone gets your name wrong? Mine is often spelt incorrectly. I’ve had Malcom, Malcombe and Malkom, among others. Just for the record, it’s “Malcolm” – and always has been since my birth certificate was signed. Accuracy is important at some times more than others. Passports come to mind. And sometimes the importance is what the name signifies. Here’s something I’ve been pondering from Luke 18 (a passage I’ll be preaching on in a couple of weeks). The differences between the crowd and the beggar seem to be along these lines. First we hear the crowd tell the blind man, “Jesus of Nazareth is passing by.” (Luke 18:37 NIV11) Then, we hear his cry, “Jesus, Son of David, have mercy on me!” (Luke 18:38 NIV11) Two different names for the same person. Who is right? What does it mean? There’s a clue in the reaction of the crowd to the blind man’s cry. They “rebuked him and told him to be quiet”, but he “shouted all the more, “Son of David, have mercy on me!”” (Luke 18:39 NIV11) The crowd’s response is probably connected to their understanding of the title “Son of David”. They are aware it is a royal messianic designation. In 2 Samuel 7:12–16 Yahweh promises David a descendant, and that he would “establish the throne of his kingdom forever”. In addition, he would be Yahweh’s son. The crowd are not ready to see Jesus in this way. They do not have the eyes of faith given to the blind man. It appears presumptuous to the crowd, but entirely appropriate to the blind man. The beggar will not be deterred either in his shouting, nor in his affirmation of the full identity of Jesus. 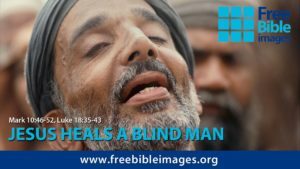 As it says in the Tyndale New Testament Commentary, “The title is Messianic and Jesus’ healing of the man in response to its use looks like an acceptance of its implications.” The name in itself was not the point, but it did point to something significant. Jesus was not just a wandering preacher, nor even an impressive healer, but the one prophesied, son of God, with an eternal authority. The same issue arises today. Which ‘Jesus’ are we seeing when we read the Bible and listen to others talking about him? The blind man ‘saw’ more clearly than the crowd. What gave him that clarity, I wonder? If you have any ideas on this, or on what can help us today to ‘see’ Jesus clearly please let me know. Leave a comment here, or drop me a line. More on this passage in the coming days.